Faced with growing obsolescence of its air defence systems that has led to its formations becoming vulnerable to enemy strikes, the Army has initiated the process of acquiring new anti-aircraft guns. In a request for information issued earlier this month, the Army has sought details from prospective vendors about guns, ammunition, maintenance and transfer of technology. The Army is looking at acquiring guns having a calibre of 30 mm or more that can engage aerial targets both during day and night using fire control radar and electro-optical fire control systems. These should also be capable of engaging aircraft without a fire control radar. Army Air Defence (AAD), one of the youngest arms of the Army that was established 21 years ago and mandated with providing tactical air defence cover to Army formations during war, has long suffered from lack of modernisation and upgrade. It has a mix of surface-to-air missile systems and anti-aircraft guns. Despite induction of a few new systems, the bulk of its weapons and equipment are obsolete or nearing obsolescence. In fact, a letter written by former Army Chief General VK Singh to the Prime Minister that was leaked into the public domain had stated that 97 per cent of air defence equipment was obsolete. The Bofors L40/L70 guns that equip a number of air defence regiments, for example, are almost five decades old. Similarly, the ZSU 23-4 self-propelled radar-controlled guns belong to the 1970s. Some indigenous projects to upgrade the existing guns and to design a new gun in collaboration with the Defence Research and Development Organisation, Ordnance Factories and Defence Public Sector Undertakings are also under way. The AAD’s missile regiments are also in urgent need of upgrade. 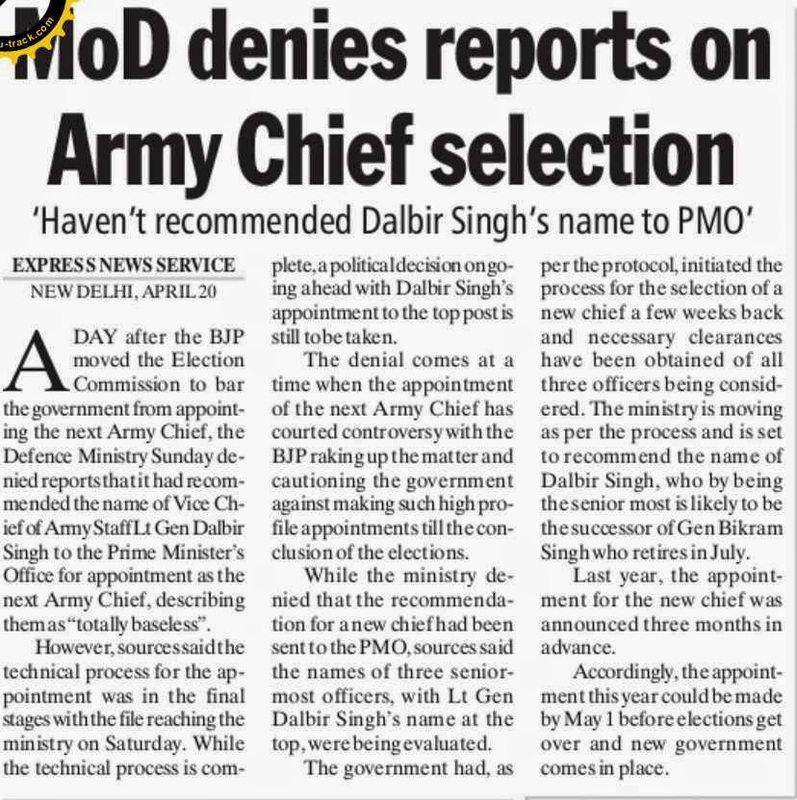 Notwithstanding objections by the BJP, the Defence Ministry is going ahead with the process of appointing the new Army Chief and has recommended the name of Vice-Chief of Army Staff Lt Gen Dalbir Singh Suhag to the Prime Minister’s Office. The recommendation of the Defence Ministry will have to be approved by the appointments committee of the Cabinet headed by Prime Minister Manmohan Singh, official sources said. The Defence Ministry has taken the step even though the Opposition BJP has said the outgoing government should not appoint the new Army Chief and should leave it to the next government that is expected to take over towards the end of next month. VK Singh, who is now a BJP member and contesting from the Ghaziabad parliamentary constituency in Uttar Pradesh, has said the UPA government “should not be in a hurry” to appoint the new Army Chief. Parents of National Defence Academy (NDA) applicants, who accompanied their wards to the city today for the NDA entrance test, alleged that they were forced to spend the entire day on the roads and pavements as there were no seating arrangements for them at the examination centres. The exam was conducted in two phases - the first paper of mathematics was held from 10 am to 12.30 pm and the second paper of general awareness was from 2 pm to 4.30 pm. The students who were not accompanied by their parents fared no better. The authorities refused to provide them space for keeping their bags and cell phones. Even after spending the entire day in the sun, the ordeal wasn’t over.Three-wheeler drivers took advantage of the situation and overcharged them for dropping them at their destinations. The 75-km long Siachen glacier sits astride two disputed boundaries — with Pakistan and China — and covers about 10,000 sq km uninhabited terrain. Along with other glaciers in this area, it is an important source of water to the Indus river which passes through Ladakh and Kargil, and then into Pakistan Occupied Kashmir (POK). Siachen is claimed by India on the basis of accession of J&K to India in October 1947 and the India-Pakistan Karachi Agreement of 1949 which described the ceasefire line beyond Point NJ 9842 on the map to be 'thence north to the glaciers'. Thirty years ago, an alert Northern Army Commander, Lt Gen M.L. Chibber, deployed troops to pre-empt Pakistan's military occupation of Siachen and ensured against India ceding this territory by default. The Indian Army occupied the Soltoro Ridge, which runs northwards to secure the glacier and territory to its east. The military significance of this deployment is that (a) it dominates Pakistani positions west of the Soltoro Ridge and blocks infiltration possibilities into the Shyok valley of Ladakh (b) it prevents Pakistani military adventurism in Turtuk and areas to its south, and (c) its northern-most position at Indira Col overlooks the Shaqsgam valley of Gilgit-Baltistan, ceded illegally by Pakistan to China in 1963, and denies Pakistan an access to Karakoram Pass. Since 1984, the line dividing the military forces of India and Pakistan in the area north of NJ 9842 has come to be known as the Actual Ground Position Line (AGPL). Siachen has always been considered a military setback by Pakistan. That the Pakistan army is nowhere near the glacier is a fact never mentioned in public and serves as a psychological drain. When Pervez Musharraf commanded the Special Services Group in Gilgit-Baltistan, he made several futile attempts to capture Indian posts near Bilafond La and suffered casualties. One of the military objectives of the Pakistan army during the Kargil war was to recapture a part of Siachen and cut off our vital communication links to this area. It failed. In the 1950s, China constructed a strategic road connecting Tibet to Xinjiang through Aksai Chin. The dispute over Aksai Chin became one of the triggers for the Sino-Indian war of 1962. In 1963, Pakistan and China signed a border agreement wherein Pakistan unilaterally ceded the Shaqsgam valley to China. This agreement described the eastern termination of the Sino-Pakistan boundary at the Karakoram Pass, ignoring "thence north to the glaciers" statement of the 1948 Karachi Agreement. This alignment and its demarcation were formalised through a protocol in 1987. According to Senge H. Sering, a scholar from Gilgit-Baltistan, “China has a huge and long-term presence in Gilgit-Baltistan and is building extensive road, bridge and telecom networks to sustain it. The drivers compelling China to develop Karakoram Corridor are diverse and mainly pertain to its economic, strategic and political ambitions.” China’s control of Shaqsgam and other valleys of Gilgit-Baltistan enables it to connect them with the Karakoram highway and its military and industrial complexes of northwestern Tibet. Notably, China has been willing to negotiate and settle the POK-China boundary with Pakistan. 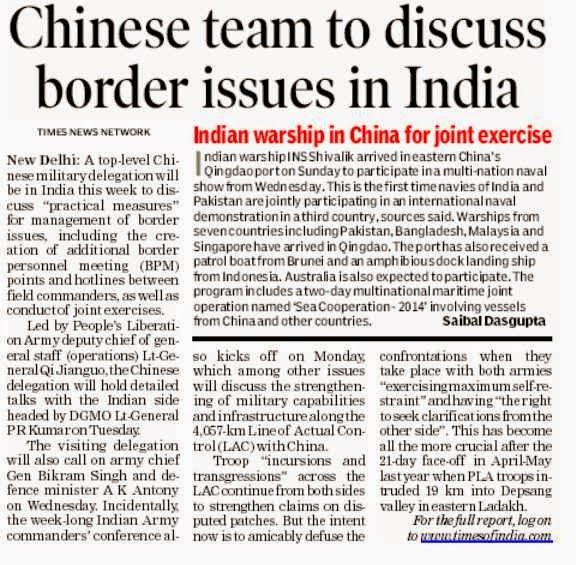 But they have refused to discuss the LAC or Chinese boundary with J&K on our side. Instead, they have repeatedly given several signals that Ladakh is a ‘disputed’ area ranging from issuing ‘stapled visas’ to visitors from J&K and refusing a visa to the GOC-in-C, Northern Command, who was to make an official visit to China as a part of the ongoing military-level exchanges, to name a few. 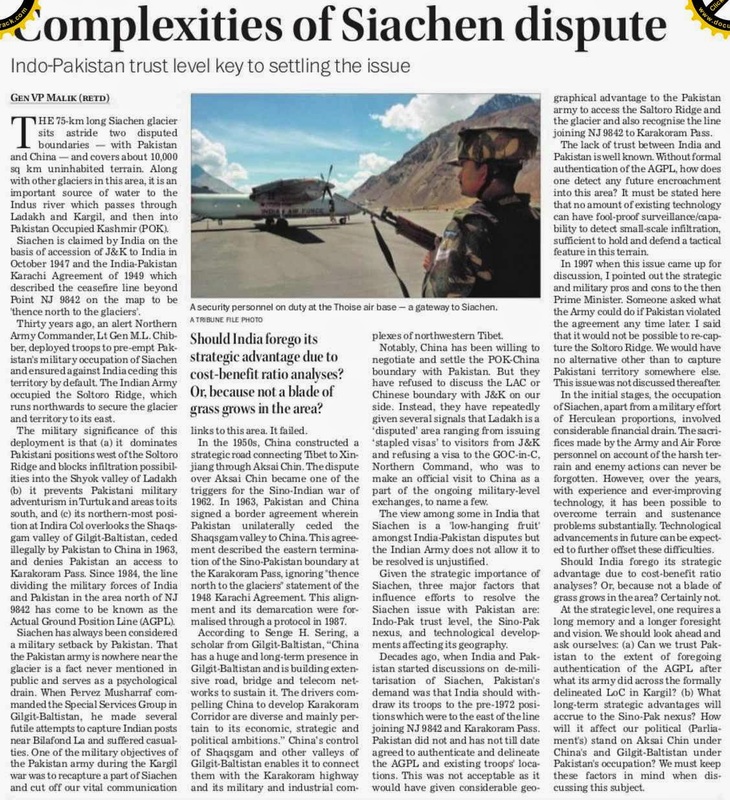 The view among some in India that Siachen is a 'low-hanging fruit' amongst India-Pakistan disputes but the Indian Army does not allow it to be resolved is unjustified. Given the strategic importance of Siachen, three major factors that influence efforts to resolve the Siachen issue with Pakistan are: Indo-Pak trust level, the Sino-Pak nexus, and technological developments affecting its geography. Decades ago, when India and Pakistan started discussions on de-militarisation of Siachen, Pakistan's demand was that India should withdraw its troops to the pre-1972 positions which were to the east of the line joining NJ 9842 and Karakoram Pass. Pakistan did not and has not till date agreed to authenticate and delineate the AGPL and existing troops' locations. This was not acceptable as it would have given considerable geographical advantage to the Pakistan army to access the Saltoro Ridge and the glacier and also recognise the line joining NJ 9842 to Karakoram Pass. The lack of trust between India and Pakistan is well known. Without formal authentication of the AGPL, how does one detect any future encroachment into this area? It must be stated here that no amount of existing technology can have fool-proof surveillance/capability to detect small-scale infiltration, sufficient to hold and defend a tactical feature in this terrain. In 1997 when this issue came up for discussion, I pointed out the strategic and military pros and cons to the then Prime Minister. Someone asked what the Army could do if Pakistan violated the agreement any time later. I said that it would not be possible to re-capture the Soltoro Ridge. We would have no alternative other than to capture Pakistani territory somewhere else. 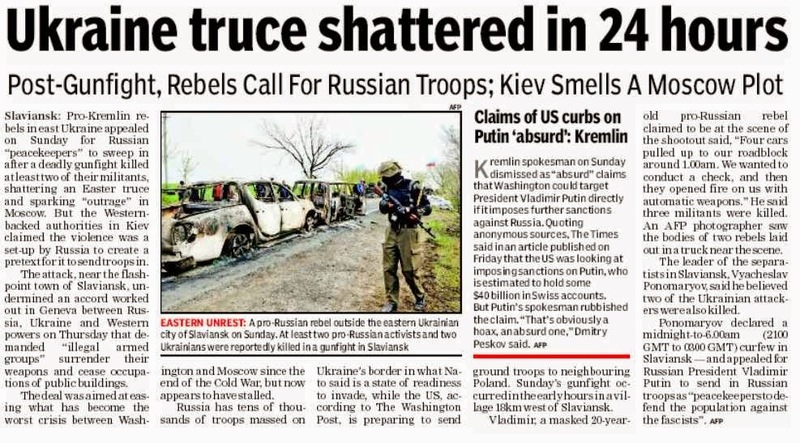 This issue was not discussed thereafter. In the initial stages, the occupation of Siachen, apart from a military effort of Herculean proportions, involved considerable financial drain. The sacrifices made by the Army and Air Force personnel on account of the harsh terrain and enemy actions can never be forgotten. However, over the years, with experience and ever-improving technology, it has been possible to overcome terrain and sustenance problems substantially. Technological advancements in future can be expected to further offset these difficulties. Should India forego its strategic advantage due to cost-benefit ratio analyses? Or, because not a blade of grass grows in the area? Certainly not. At the strategic level, one requires a long memory and a longer foresight and vision. 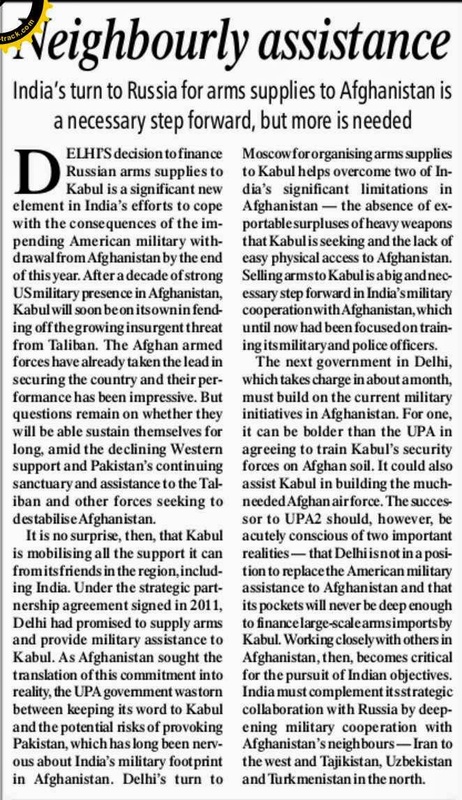 We should look ahead and ask ourselves: (a) Can we trust Pakistan to the extent of foregoing authentication of the AGPL after what its army did across the formally delineated LoC in Kargil? (b) What long-term strategic advantages will accrue to the Sino-Pak nexus? How will it affect our political (Parliament's) stand on Aksai Chin under China's and Gilgit-Baltistan under Pakistan's occupation? We must keep these factors in mind when discussing this subject. Prime minister Manmohan Singh’s recent exhortation that a global no-first-use convention relating to nuclear weapons should be established, is surreal. He argued that the sole purpose of nuclear weapons being to deter nuclear aggression, the nuclear weapon states should formally declare their adherence to this norm, permitting the establishment of a global no-first-use regime, reduction and finally, elimination of nuclear weapons. How the nuclear doctrine would be modified has not been clarified, though there is speculation that India’s traditional ‘No-first-use’ posture would be reviewed. Election manifestoes are not taken seriously in India since they are plainly designed to garner votes. Not so the BJP. Its manifesto in 1998 had stated that if elected to power, it would “Re-evaluate the country's nuclear policy and exercise the option to induct nuclear weapons.” This had attracted little attention except for a few comments. 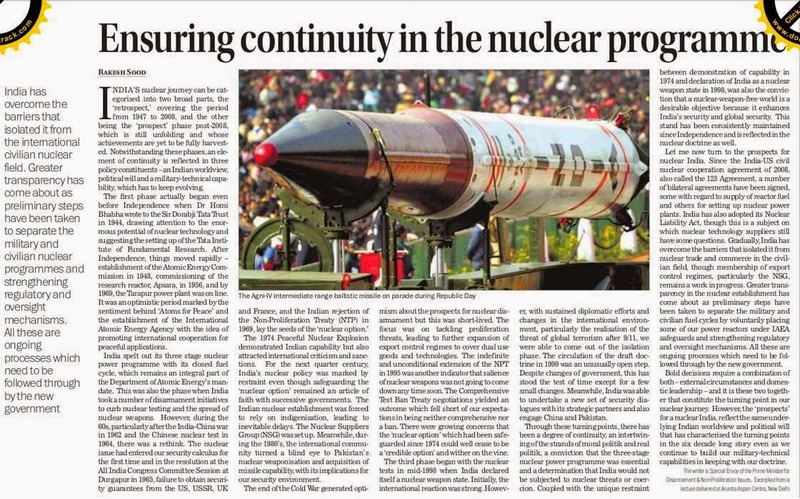 Hence the huge surprise when the Vajpayee-led NDA government conducted the nuclear tests in 1998, ostensibly to counter the threat from China and Pakistan. Shortly thereafter then Prime Minister AB Vajpayee declared that India would pursue a ‘No-first-use’ policy in regard to employing nuclear weapons. This was reaffirmed in Parliament in December 1998. Ultimately, the National Security Advisory Board (NSAB) undertook an extensive exercise to draft India’s nuclear doctrine. There was some ambiguity after its release in August 1999, when the National Security Adviser, Brajesh Mishra, declared that it was only a draft proposal by the NSAB and not yet approved by the government. The unseemly haste in releasing the doctrine followed by a disclaimer was widely believed to be designed to seek electoral advantage by emphasising the BJP’s commitment to national security. Ultimately, India’s nuclear doctrine was officially released in January 2003 by promulgating the decisions thereon by the Cabinet Committee on Security stating, inter alia, that India would adopt a policy no-first-use of nuclear weapons. These would only be used to retaliate against a nuclear attack on Indian territory or on Indian forces. But in the event of a major attack by biological or chemical weapons, India would retain the option of using nuclear weapons. Further, the doctrine pledges that India will not use nuclear weapons against non-nuclear weapon states. These are important qualifications to India’s nuclear weapons policy, but they leave three important dilemmas. First, the problem of attack by non-state actors remains open, which has been the subject of anxious debate in the three global Nuclear Security Summits. Second, how does one define a ‘major attack’ by biological or chemical weapons? What is ‘major’ and what is ‘minor’ could be interminably debated. Third, serious difficulties arise in identifying the perpetrator of a chemical or biological weapons attack. They could be undertaken by a state actor or non-state actor and, conceivably, by a non-state actor assisted by a state actor. The present difficulties in identifying the source of chemical weapons attacks in Syria are instructive in this regard. The BJP’s current unease with pursuing its ‘No-first-use’ policy is believed to be resultant of internal discussions regarding Pakistan's determined efforts to increase its nuclear stockpile and deploy tactical nuclear weapons. Pakistan, of course, has no use for a no-first-use doctrine, arguing that the weaker conventionally armed power in a nuclear adversarial situation has to rely on nuclear weapons to assure its security. NATO had refused to accept a no-first-use policy during the Cold War, although this was declared by the Soviet Union on the premise that Warsaw Pact’s superior conventional forces could defeat NATO. This logic might also be behind Pakistan’s decision to deploy tactical nuclear weapons to counter India’s Cold Start strategy, despite the dangers inherent in this strategic posture. Paradoxically, India is pursuing the same nuclear policies as the United States and the former Soviet Union. It wants to deploy the strategic triad comprising land, air and sea borne nuclear weapons. While India is committed to a ‘credible minimum deterrent’ posture, there is little understanding about what exactly this means in terms of weapon systems and funds. Paradoxically, India’s armed forces have been kept out of the nuclear decision-making structure. The Atomic Energy Agency (AEC) is charged with maintaining the physical infrastructure and security of the nuclear arsenal but the armed forces are charged with maintaining the delivery systems and the actual utilisation of nuclear weapons. Further, it remains unclear what will be India’s response to a limited attack with tactical nuclear weapons. A detailed study India's nuclear doctrine is called for that has to address all these issues in their totality. An exercise to either promote India’s present exception-riddled ‘No-first-use’ policy, as sought by Manmohan Singh, or reject it completely in a knee-jerk reaction, as suggested by the BJP manifesto, will not serve the national interest. A military investigation into a botched intel op in the North East had established his ‘command failure’ when he was the Corps commander at Dimapur. This ban, imposed when General V K Singh was Army chief was lifted immediately on June 5, 2012 after Gen Bikram Singh ook over, thus making Suhag his successor. If the ban was still in force, it would have instead enabled Integrated Defence Staff headquarters Deputy Chief Lt Gen Ravi Dastane to succeed Bikram Singh. The present battle is tainted with bitter memories. Several former chiefs form the dramatis personae in a saga that spans many episodes, ranging from the time General J J Singh was the Army Chief in 2005. The common player is General V K Singh, the BJP’s Lok Sabha candidate in Ghaziabad. His main grouse has been that Gen J J Singh and his successor Gen Deepak Kapoor played a role in reducing his tenure as Army Chief by 10 months. This action, in turn, benefited Gen Bikram Singh and Gen Suhag. The Discipline and Vigilance (DV) ban is now coming back to haunt Gen Suhag, the senior-most Gorkha regiment officer in the Indian Army. The government appointed him as Army commander on June 15, 2012 and his seniority was restored retrospectively from June 1, 2012. When Bikram Singh demits office on July 31, Suhag would be the senior-most officer in the Indian Army, which automatically makes him eligible to be appointed chief going by the seniority principle. The Supreme Court will hear Dastane’s plea on May 3. If the UPA government decides to make Lt Gen Suhag the next Army chief, it would have to do so before the date of court hearing. By convention, the name of the new chief is announced two months in advance, or even before, but the Defence Ministry seems to be in a hurry to elevate Suhag. The first time this convention was breached was when Gen Bikram Singh was named chief three months or more ahead of his predecessor Gen V K Singh’s retirement on May 31, 2012. In Dhowan’s case, the government had waited 50 days to appoint him the Navy chief. Gen Dastane’s petition contends that he was overlooked for appointment as Army Commander by the government, despite being eligible on June 1, 2012, when two vacancies arose. But the Prime Minister Manmohan Singh-led Appointments Committee of the Cabinet had approved Gen Suhag’s promotion as Army commander before the ban came into effect. Dastane, who has the distinction of commanding the 14 Corps headquartered in Leh in 2011-12, and whose responsibility was to defend Ladakh and Siachen from Pakistan and China, has contended in his petition that he should have been made the Army commander on June 1, 2012. Two posts had fallen vacant that day. One was filled up by promoting the-then Military Secretary Lt Gen Sanjiv Chachra. Sources say the other was deliberately left vacant and reserved for Gen Suhag, since there were enough signs that Bikram Singh would vacate the DV ban. Sources close to Dastane, speaking to The Sunday Standard, question General Chachra’s motives. It is the Military Secretary’s responsibility to empanel the names of officers for promotion as Army commanders. 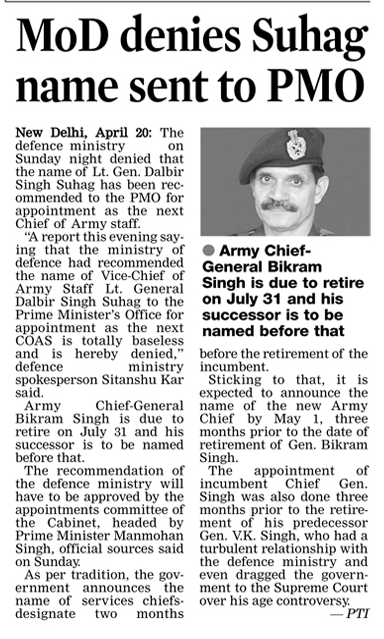 On June 1, 2012, vacancies arose when the Western Army Commander Lt Gen Shankar Ghosh retired and Eastern Army Commander Bikram Singh became the Army chief. As per military rules, the MS should have recommended four names for the two vacancies, leaving the choice to the Appointments Committee of the cabinet. Gen Chchara, however, recommended only two—his own and Suhag’s. “If four names had been sent to the ACC, then Dastane would have been the automatic choice on June 1, 2012, as Suhag was under a DV ban on that day,” the sources contended. If Dastane had been promoted as army commander, as the senior-most on July 31, 2014, he would also have been eligible to become the army chief after Bikram Singh.